Sautee the garlic, onions, tomatoes, and bell pepper in a bit of oil until the onions are translucent and most of the liquid from the tomatoes have evaporated. Season with salt and pepper to taste and let it cool. When cool, add to the salmon along with the beaten egg and mix well. Form patties and roll them in bread crumbs and lay them on a cookie sheet. When done put the cookie sheet in the freezer; freeze the patties until firm. Once they have firmed up you can either fry them up or put them in a plastic bag to fry another day. This is a good way to keep the salmon from sitting in the refrigerator until it starts to grow something. Freezing keeps the patties from falling apart when you fry them. Pan fry them in a bit of oil until browned on both sides. 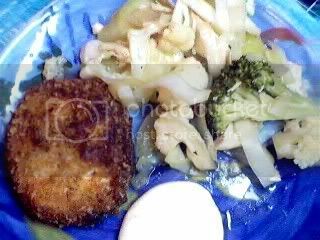 We usually serve these with the Thai sweet chili sauce or banana sauce, but we were out of both, so I tried the sour cream and wasabi sauce from Claudine, and it was terrific with the croquets. At least my husband and I liked it. The kids had theirs with ketchup. Hi Manang and Claudine! Yeah, I love ‘hiding’ vegetables. Although my girls are really not as bad as other kids when it comes to vegetables. They are just real wary of ‘exotic’ ingredients. I just keep putting it in front of them, I figure they will come around eventually, right Claudine? That Wasabi/sour cream sauce is really good. I can think of many other ways to use it! Thanks for this idea. I just love recipes calling for “hidden veggies”. Kids always find it more appealing to eat veggies this way. I also will have to hunt for wonton wrappers. I wanna try siomai too. Kaya lang, my steamer is so tiny (one that came with my smallest saucepan).